Voice: Last Sunday the candle of peace was lit. We light it and the candle of hope again as we remember that Christ will come again and bring to the world everlasting peace. A person lights the candles of hope, and peace. 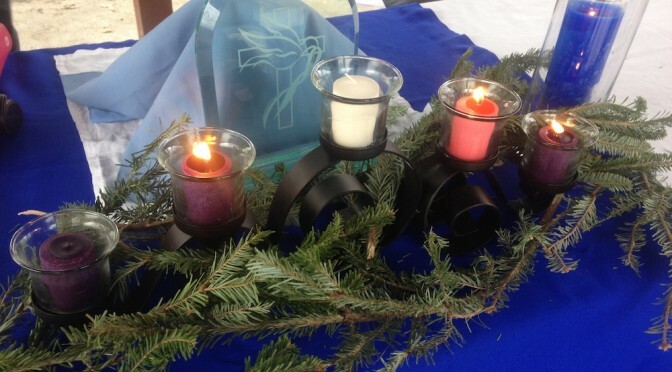 Voice: The third candle of Advent is the Candle of Joy. It reminds of the joy that Mary felt when the angel Gabriel told her that a special child would be born to her – a child who would save and deliver his people. Voice: We light this candle to remember that Christ brings the promise of a new life – a life in which the blind receive sight, the lame walk, and the prisoners are set free. We light it to remember that He is the bringer of true and everlasting joy. Voice: Let us pray. Loving God, we thank you for the joy you bring us. Help us prepare our hearts for this gift. Bless our worship. Help us to hear and to do your word. We ask it in the name of the one born in Bethlehem. Amen.